We can convert int to String in java using String.valueOf() and Integer.toString() methods. Alternatively, we can use String.format() method, string concatenation operator etc. It is generally used if we have to display number in textfield because everything is displayed as a string in form. Let's see the simple code to convert int to String in java. int i=10; String s=String.valueOf(i);//Now it will return "10"
Let's see the simple example of converting String to int in java. 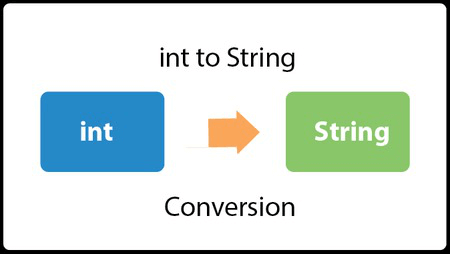 Let's see the simple code to convert int to String in java using Integer.toString() method. int i=10; String s=Integer.toString(i);//Now it will return "10"
The String.format() method is used to format given arguments into String. It is introduced since Jdk 1.5. Let's see the simple code to convert int to String in java using String.format() method.